A vehicle plunged about 200 feet off Highway 166 east of Santa Maria Friday morning. Rescue workers then found a dead body in the wreckage. The crash occurred around 7 a.m. near Rock Front Ranch. It is unclear what caused the driver to leave the roadway. No one else was injured in the crash. Shortly after 4 p.m., flames from a car fire on Highway 101 spread to brush at the top of the Cuesta Grade. More than 45 acres have burned in the rapidly growing fire. Two of the three northbound lanes are currently closed to traffic. Meanwhile, a fire has been burning closer to Santa Maria but also east of the city near Highway 166. 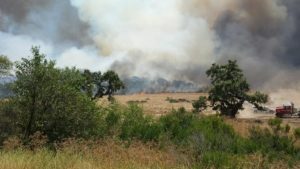 The blaze, which has been dubbed the Alamo Fire, started near Twitchell Reservoir at approximately 3:43 p.m. Thursday. At least part of the fire is in San Luis Obispo County. As of Friday afternoon, the Alamo Fire has burned 3,000 acres and is 10 percent contained, according to Cal Fire. Fire officials say the blaze is spreading. Evacuation orders are in effect for residents on Blazing Saddles Road and White Rock Lane. There is heavy smoke in the air above Santa Maria.